It was May 2015 at the AWS Summit in Chicago, where I first heard about AWS Lambda. The company I worked for used Linode at that time, I had no chance of using it, but I still found the serverless concept fascinating. The bulk of my work at my current gig is about transforming data: we pull it from an API, we need to transform and load it into our own data store. Sure the worker boxes can do the job, but maintaining a series of these instances takes effort. AWS Lambda would be the perfect solution for us, but Amazon does not support Ruby natively, which is most of our business logic is written in. AWS, as of this writing, offers Lambda for three main platforms: Java, Node.JS, and Python. I played around running Clojure on it, which worked as the code is compiled into a jar file, but our current app - due to its monolithic nature - can’t support any other languages just yet. Amazon claims you can run your language of choice on AWS Lambda, Ruby included, but I have not found a comprehensive guide that would describe how. Once you can package up your app to run as an executable, you can run it. I found this blog post that describes how Swift code can be bundled, deployed and invoked on AWS Lambda. It was clear to me that this solution would work, I only had to package Ruby with its own interpreter to accomplish the same. I looked for tools that can do this and found Traveling Ruby. You can package your code and run it as an executable on the user’s computer, no local Ruby installation is needed. I wanted to try it locally first, thinking if it works there (on OSX), it should work on AWS Lambda as well. This blog post is a step-by-step tutorial to run MRI Ruby on AWS Lambda. You can follow along with the accompanying project, I listed commit points at the end of each section. This tutorial assumes you are familiar with AWS, you have access to the AWS Management Console and you have the AWS Command Line Interface configured to interact with your services via the terminal. You'll need the same version of Ruby as the one Traveling Ruby offers. The latest there is Ruby 2.2.2, I'd recommend installing that through Rbenv or RVM. I made sure my Ruby version in the project is 2.2.2 by setting it with Rbenv. # Figure out where this script is located. # Run the actual app using the bundled Ruby interpreter. We ran the Ruby code with the Traveling Ruby packaged Ruby runtime, not with the locally installed Ruby, that was set up with a Ruby version manager. The index.handler will be invoked by Lambda, which will spawn a new child process by executing the hello shell script, which will run the Ruby code with Traveling Ruby. and a hello_ruby.zip file should be created in your deploy directory. 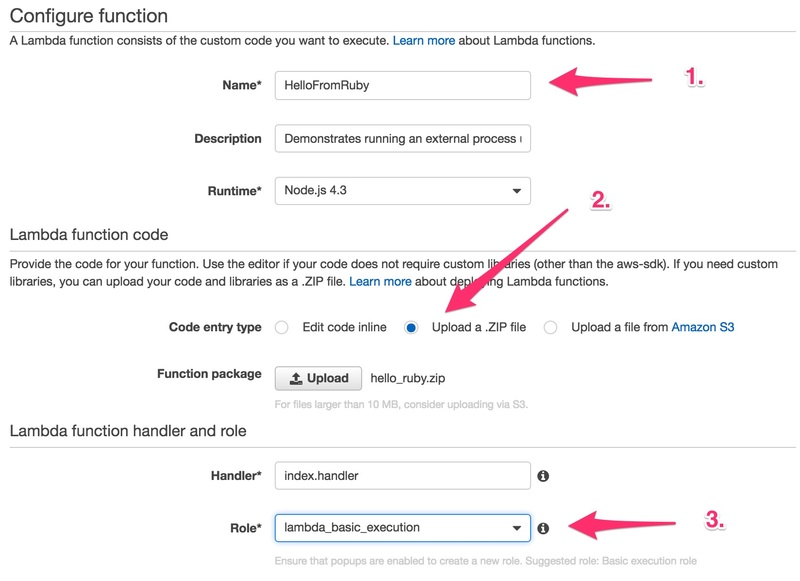 Chose the option of "Upload a .ZIP file"
Confirm it and create the Lambda function. The string "Hello from Ruby!" is coming from the Ruby code executed by Traveling Ruby, just like we did locally. Woohoo! Congrats, you’ve just created an AWS Lambda function with MRI Ruby. Your 'HelloFromRuby' Lambda function will be deleted when you run make delete in your terminal. Go back to the AWS Management Console to verify that your Lambda function got deleted. If everything is configured properly, you should be able to create your AWS Lambda function by running make create in the terminal. 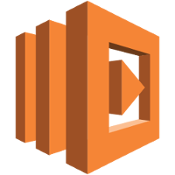 This blog post guided you through the steps of running MRI Ruby on AWS lambda. In the upcoming post, I'll show you how you can add gems and talk with an RDS instance from your Ruby code on AWS Lambda. Great article. Works like charm! Although the piece that asks the users to create a Python Lambda is not required here I guess, its tad confusing too, as ultimately the ruby process is invoked via Nodejs Lambda. Good point, it's also a demonstration of how easy it is to use a different (supported) language on AWS Lambda. great post, thanks for sharing. Is there a way to augment the ruby env with custom gems? @Attila thanks for the quick reply!